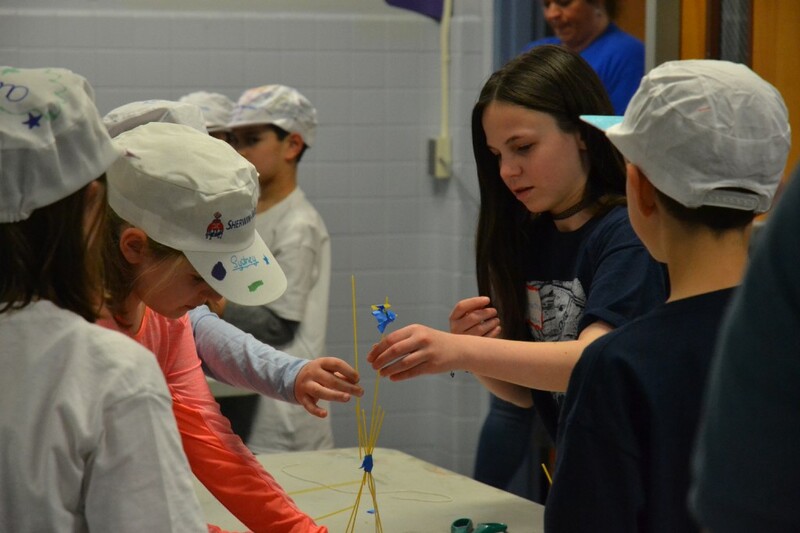 The students were grouped together with fourth graders from other towns and tasked with completing six challenging games. For example, during one station, the groups were asked to build a bridge across a pair of chairs using only 50 McDonald’s straws and their paper wrappers. The goal was to build the bridge that could support the most weight. “It’s really interesting to watch the students work together to do some high-level problem-solving,” said parent volunteer Joe Langowski, who also serves as superintendent for the Lumberton Township School District. Students from Cinnaminson, Palmyra, Moorestown, Tabernacle, Delran, Hainesport, Maple Shade, Pennsauken, Riverside and Riverton participated in the competition, which was held at the Memorial School in Cinnaminson. The event is also known as the Inter-district Conference Day. Elaine Mendelow, the event’s coordinator, said the first challenge for the students was to form a cohesive team with students they likely had never met before. Often, the groups start by arguing over whose idea is the best, but they normally begin to work together more smoothly as the event progresses, she said. “This is what adults have to do working in business,” she added. Moorestown fourth-grade student Neeka Vojdani said she felt the event helped prepare the students with skills they will need later in life. “I really like the Brain Drain Games because I think it’s a good experience for different kids to get together and solve a series of activities,” Neeka said. Mendelow said the event encourages students to be better listeners and more open-minded to the ideas of others. Langowski said he saw the children displaying a lot of teamwork and higher-order thinking skills during the event. Tabernacle fourth-grade student Nicholas Furia said the games were cool and different. “It’s been really fun,” he added.